Quorum sensing is a process through which microorganisms communicate and then regulate various cellular processes. With the description of the molecule, communication could be either stimulated or inhibited, making it an extremely valuable tool for additional studies on bacterial communication and its effect on various genetic pathways. The study results have been reported in the journal Chem on April 15th, 2019. Generally, bacteria respond to their environment by talking to one another via a form of chemical communication known as quorum sensing. The cells not only discharge a signal molecule but also track the molecule’s concentration simultaneously. When the signal molecule is increasingly secreted by more number of cells, it can surpass a threshold concentration and trigger specific genetic pathways, for instance, to form a protective biofilm or create toxins. If we would be able to influence quorum sensing, we might be able to use it to treat serious infections. And it would also be useful to investigate how quorum sensing exactly works. To achieve this, a modulator of quorum sensing that can be controlled externally can prove useful. That is the reason why Hansen and coworkers in the synthetic organic chemistry group headed by Professor Ben Feringa began to incorporate a light-sensitive switch within a molecule utilized by microorganisms as a signal for quorum sensing. The molecule includes a head as well as a flexible carbon-based tail, linked through a β-keto-amide linker. The idea was to integrate a switch into this flexible tail. This meant we had to connect the modified tail to the head via β-keto-amide linkage. However, the synthetic process to obtain this linkage produces a very unstable intermediate, which made it almost impossible to synthesize the molecule. Leveraging the elaborate experience of the synthetic organic chemistry team at the Stratingh Institute of Chemistry at the University of Groningen, the investigators ultimately discovered a solution in the form of a novel coupling reaction with a stabilized intermediate. 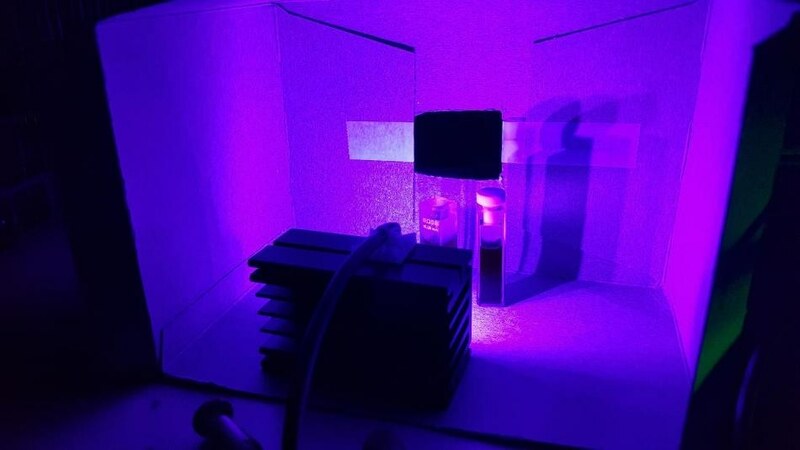 With the help of this intermediate, the team successfully produced photoswitchable derivatives in a rapid and simplified manner. Along with Master’s student Jacques Hille, Hansen created a “library” of 16 varied compounds that are capable of acting as antagonists or agonists of quorum sensing. All the compounds were equipped with a light-operated switch, and they were based on a molecule that is utilized in a specific quorum sensing system in bacterial species called Pseudomonas aeruginosa, which possess approximately five of these quorum sensing systems. In association with molecular biologists from the laboratory of Arnold Driessen, a Professor of Molecular Microbiology and also from the University of Groningen, the researchers transferred the genes of one of these systems to an E. coli reporter strain. This made it possible to test the impact of the freshly developed compounds without the intrusion of other kinds of quorum sensing mechanisms. When bioactivity tests were performed on the acquired compounds, the parts of the molecule essential for regulating quorum sensing were observed. Four carbon atoms seemed to be the optimum number making up the tail. The tail bent when the switch was flipped with light. Incredibly, the quorum sensing signal was induced by the bent tail, whereas the straight tail had no impact. Overall, it appears that small changes in the molecule can have a large effect on its activity, but we don't yet know exactly why. The researchers did locate a compound that had the ability to robustly prevent the quorum sensing signal and—following irradiation with light, which caused the tail to bend—to robustly stimulate it as well. The variation in activity was over 700-fold, which is rather huge. The research was a cooperative effort of organic chemists at the Stratingh Institute for Chemistry and microbiologists from the Groningen Biomolecular Sciences and Biotechnology Institute (GBB). Both institutes are part of the Faculty of Science and Engineering at the University of Groningen.